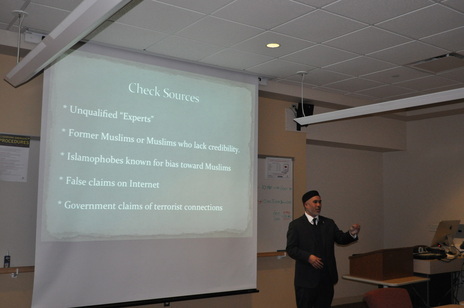 (Plainfield, IN 3/10/14) Last week, Islamic Society of North America (ISNA) Communications Director Edgar Hopida spoke to journalism students on “Covering Islam in the Media” at Ball State University located in Muncie, Indiana. The presentation consisted of the basic beliefs and practices of Islam as well as common negative frames that journalists typically use when covering stories about Islam and Muslims. Hopida also provided alternative frames and stories that journalists can cover that reflect more accurately, the diversity of the American Muslim community. This presentation was part of a series of guest speakers invited to speak at Professor David Sumner’s Special Reporting Class to talk about how their religious tradition is covered in the news.